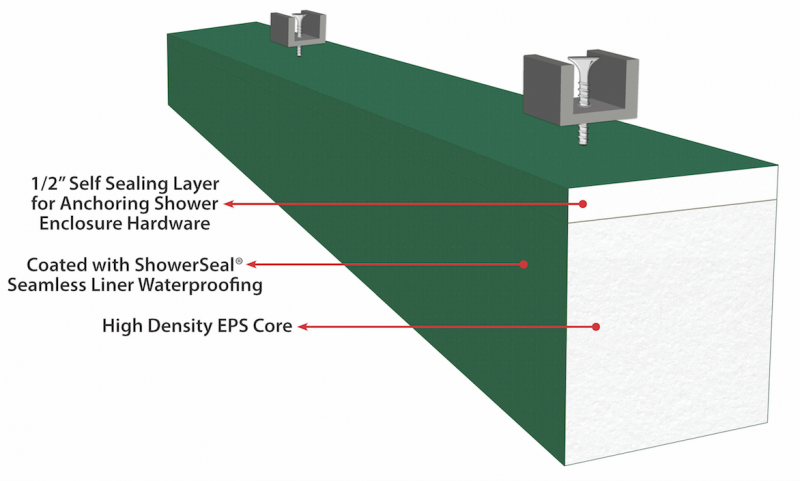 Shower products manufacturer KBRS has received a patent for a self-sealing, prefabricated shower curb that prevents leaks and tile failure. The HardCurb is engineered to prevent common occurrences from happening, the company says, because it has a solid EPS core and self-sealing anchoring cap. The shower curb is often described as one of the most critical components of a tile shower, KBRS explains. When glass enclosure anchoring screws penetrate tile shower curbs constructed from wood, mortar, or hollow prefabricated foam, they create a “breach” in the waterproofing membrane, which becomes a weak spot that is highly susceptible to moisture penetration. It also can eventually cause leaks, water damage, and tile-pop. But the prefab, ready-to-install HardCurb is a real problem-solver, the company says. Because it’s comprised of two components—a high-density closed-cell foam base and a higher density composite self-sealing anchoring cap—it prevents water intrusion. “The anchoring cap is made of a self-sealing material layer that is configured to retain a fastener to form a water-resistant seal between the fastener and the composite anchoring cap component,” the company says. “This engineered solution prevents the typical leak and rotting problems associated with traditional shower curbs. HardCurb is easy to cut-to-fit in the field and install with any prefabricated shower pan or sloped mortar bed.